Established in 1920, the 1406 square km (543 square miles) Kootenay National Park in British Columbia, Canada, offers a wide array of scenic attractions. Hanging glaciers and breathtaking summits, the limestone Marble Canyon and natural mineral pools at Radium Hot Springs are just some of the attractions the park has to offer. The area that is now Kootenay National Park was once a meeting place for Plains and Mountain First Nations as well as fur traders and explorers. Pictographs and ancient paint pots used by the Kootenai Indians to decorate themselves and their teepees years ago are found in this park. 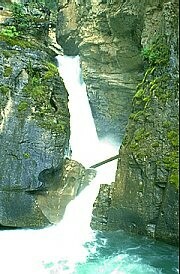 Kootenay National Park lies 888 km east of Vancouver and 170 km west of Calgary. It can be reached from the north at two access points on the Trans-Canada Highway: Castle Junction in Banff National Park (via Highway 93 South - the Kootenay Parkway) or Golden (via Highway 95); or from the south via Highway 93/95. The closest full service towns are Radium Hot Springs, just outside the park's West Gate, and Banff, 33 km east of the park's north entrance. Highway 93 (also called the Kootenay Parkway) runs 94 km through the centre of the park. Make sure to factor in plenty of time for breaks, slow traffic, and inclement weather conditions. The maximum speed limit inside the national parks is 90 km/hr, with several areas having slower limits for wildlife safety. There are four seasonal campgrounds located in Kootenay National Park: Redstreak (50 sites), McLeod (98 sites) and Marble Canyon (66 sites), Crook's Meadow Group Camp (61 sites). Water, fire pits and toilets are provided. Showers and sewage facilities are located at Redstreak campground. An extensive trail system leads the visitor to scenic viewpoints, glaciers and lakes. The Floe Lake trail leads to the mountain lake where pieces of glacier float near the stunning backdrop of a sheer rock wall. A 2 hour hike leads to Stanley Glacier. With its hanging valley this hanging glacier must be seen. In the off-season, information can be obtained from the Yoho National Park Visitor Centre.